Un groupe qui vient de Kingston dans l'Ontario ne peut que susciter notre intérêt. Ten Sleep c'est Kynan et Rob, 2 potes passionnés de musique et qui comme pas mal de monde jonglent entre une vie déjà bien remplie et le besoin impérieux de composer, de produire, de créer. Rob nous raconte la genèse de leur album "Suburban Love", en V.O. svp ! 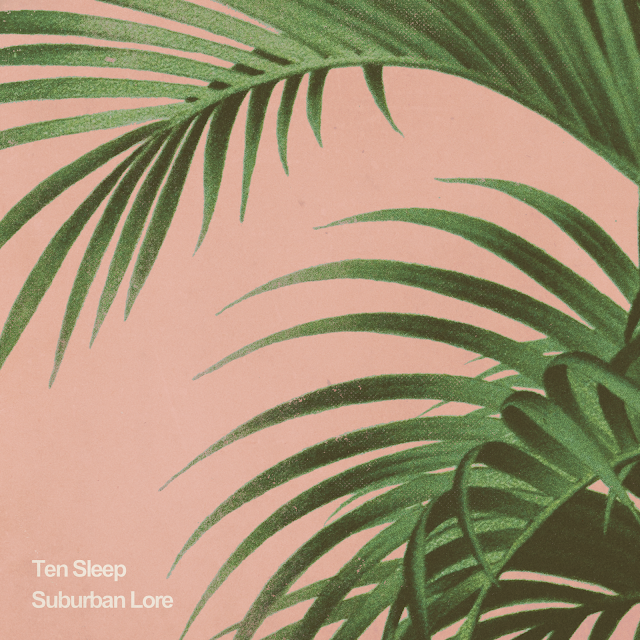 "Ten Sleep started in 2013 from the dissolved state of another local band we played in. People went off to college but Kynan and I wanted to keep writing music. The past couple of years have been somewhat quiet for us; we had a hard time locking down more band mates because of our style and the area we're from. Because of this, we didn't play very many shows, we just focused on writing and working on our craft. The last bit of 2016 was spent with a little bit touring as our friend Chris hopped in on guitar duties." "Writing never really stops for us it seems, so pretty much after our last EP was released, we had began writing a new batch of songs, one of which is on the album - "Townies" - which we had started in June of 2015 I believe. "Suburban Lore" was much more natural for us in terms of aesthetic and feel - on our last EP "No Place Like House", we were playing around with writing with certain feelings or emotions in mind. "Suburban Lore" is the result of writing what we are feeling musically rather than trying to hit a standard or mood - basically playing what comes out. As an artist, I think it's important that you push yourself to write and create within certain parameters because the result is almost always something you wouldn't expect. This album, we had set parameters for some songs, but just for how we wrote the instruments. The first single we released ("Roommates") is a good example of that. "Roommates" started as a drumbeat I made in an app on my phone; the same one in the song today, actually. I sent it to Kynan and asked for him to sit down and try to get a keyboard hook going over top. I think within a week or so, we had the first half of the songs progression. One other song that we got as a result of experimenting was "St. Petersburg". We made it an objective to write a song, or get a song started at least, within an hour and as a result, we got the foundation for the song set (drums, keyboards, guitar hooks, etc...)." "We began recording with Todd Barriage at his place, Borland Studio, on the first weekend of January of this year. We spent every weekend at his studio until the third week of March recording the album. It was a rough process, as Kynan had classes to attend, and I was working full time. From January to mid-March, I would go to work all week, drive to Todd's Friday night, spend the weekend in studio, and then drive home Sunday evening. (My social life took a serious hit to say the least, and my girlfriend wasn't very impressed, either.) This tedious process turned out to be a very positive one for the record's sake, however. Each weekend, we'd go over what we had from the last session, and make changes or discuss notes that we had made during the week listening to mixes. With all the time we were spending in studio, we were able to lock down exactly how we wanted everything to sound, as if it were our own studio and Todd was a member of the band. I think this is very apparent on the record ! It was a long couple of months for all of us, but we believe it was very much worth it." On vous confirme que ça valait le coup de sacrifier tous ces week ends, "Suburban Lore" est une vraie réussite que l'on vous propose de savourer sans + tarder !